Last Autumn a couple, college students who’d been going out for eight months, broke up. Nothing so unusual about that. On reflection, the girl was sad about the situation, so wrote a letter to her former boyfriend apologizing for her part in the breakup. That’s not so common, but I’m sure it happens from time to time. But listen to this! When he got the letter, the boyfriend went through it with a red pen and graded it, like a teacher would. He gave it 61/100, “D-”. Then he sent it back to her. He judged it unacceptable. Not only did he send it back to her, he took pictures and posted the marked letter on social media. Now you can read about it on the BBC News website. Not surprisingly, they’re still not talking to each other. I’m not sure how you would feel about having such an intimate apology marked, graded and published for all the world to see. Perhaps we think to ourselves, I’m glad that will never happen to me, I’ve got nothing to apologise for. But doesn’t Jesus in the bible teach us to pray to God in heaven and say, “Forgive us our sins, as we forgive those who sin against us?” The fact is that everyday, everyone of us sins against God in hundreds of ways. Every sin is an offense against God, and by rights he could take away all his goodness away from us. So we ought to be asking ourselves the question, if I’m praying to God, and asking him to forgive my sins, as I must do, what does God think of my prayers. If he were to mark them, would they pass? Does he accept them? Has he actually forgiven me? Did you know, there was actually a time when Jesus heard two people praying, he did give his judgement on those prayers, and he has published that in the bible for all the world to see?! You can read about it in Luke 18. Two very different people, two very different prayers, two very different results. One was judged completely unsatisfactory – a prayer that God would never hear. The other was a prayer that God answered more abundantly than the man praying ever hoped for. The one man was a Pharisee, an ultra-religious man. If you were to ask people on the street who they thought could pray the best prayers, they would point to him. If anyone could pray A+ prayers, it would be this Pharisee. The other man was a tax collector. He was seen by society as the lowest of the low, a traitor. He collected taxes from the native Israelites on behalf of the enemy occupiers, the Romans. Nobody could imagine God ever hearing his prayers. What was Jesus’ verdict? He said, “I tell you, this Tax collector went down to his house justified rather than the other; for everyone who exalts himself will be humbled, and he who humbles himself will be exalted”. The Pharisee’s confidence was all in himself. He only came to God to boast and brag. He didn’t want anything from God except his approval, which he was sure he deserved. He didn’t feel he needed anything, didn’t ask for anything, so he didn’t get anything. The Tax collector, on the other hand, despaired of himself. He knew he deserved only judgement from God. 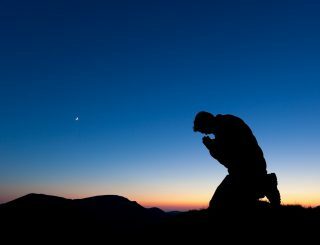 Yet, he dared to hope that God would be merciful – else, why would he pray? God had already given the tax collector something the Pharisee didn’t have: a grain of faith. God had opened his eyes so that he saw himself as God saw him. But he’d also caught a glimpse of something in God that the Pharisee had never seen, because he’d never looked for it: he saw that God is gracious – to those who ask he gives blessings that we don’t deserve: mercy, forgiveness, peace, eternal life. The tax collector asked for mercy: perhaps the best he could hope for was that God would withhold judgement. But Jesus said he went home justified. That means that God gave him a full pardon, set him absolutely free from his sin, declared him to be as righteous as God himself, with full and free access to heaven and eternal life. How about you? Have you ever prayed to God like that Tax collector did? If we come to God with any sense of self-satisfaction God will not hear our prayers. God won’t accept a list of the things that we have done as a reason to bless us. But if we come despairing of ourselves, just laying before God the evidence of our sinful hearts and asking for mercy for Jesus sake we can be sure that he will hear and answer by giving us eternal life, as he did that Tax collector.